The Call to Wholeness is a primary living language. It speaks to the deeper part of who we are and how we activate change and growth through the seasons of life. We travel with experience that is both known and unknown. We have a sense of who we have been, who we are and where the CALL is inspiring us to step through a new doorway of our life. This is often the kind of depth process that requires companioning and witnessing, a place where we can be truth-tellers and share a common language. Mythos Journey provides a powerful way to connect and experience art and life. Through the layers of creative ideas and easy, inspirational art as process we are weaving the mythic threads of our own journey, and re-storying the stories that ready to be transformed. Mythos Journey over the years, has provided a safe and sacred space for healing and wholeness. 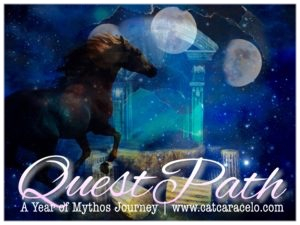 This year, once again, QuestPath | A Year of Mythos Journey, begins on November 1st. QuestPath offers experiential journey space for enrichment and integration, using the language of symbol, metaphor, archetype, parts of self and art as process. QuestPath is is designed to promote personal healing and growth, the principles of depth work and transformation are blended throughout this year long program. Many Quest Sisters have found that there is tremendous energy discovered within the process, this is living energy that is translated into ones life. We are all seekers, healers and visionaries by nature, but many times that energy is clouded by life, circumstance and points of pain that are held in the past. Visioning in action and becoming who we want to be, is first developed in the mythic realm within QuestPath. It is through the journey process that we can restore balance, re-story life, find healing, understand wholeness, create magic and grow our possibilities.